HostGator, as one of the biggest hosting provider in the world, offers its hosting service in more than 200 countries. They provide shared hosting, reseller hosting, fully managed dedicated servers linux and windows included, vps web hosting plans. Virtual private server packages by HostGator are designed on Linux platform that comes with full root access. This allows installing the newest software and completely customizing the server to meet clients’ demands. HostGator offers unlimited hosting with three plans to choose. The cheapest web hosting plan by Host Gator Hatchling plan is featured by unlimited bandwidth and disk space. It allows to setup one domain and to use a shared SSL certificate for secure connection to a site. There is a wide range of unlimited features such as FTP accounts, sub domains, email accounts and MySQL databases. Free site builder, free scripts, free site templates and more are also included in Hatchling hosting plan by HostGator. You can buy Hatchling plan for only $0.01 per month in case you apply a special HostGator coupon code provided by PRchecker.info site, that results in almost free web hosting by HostGator. 3. 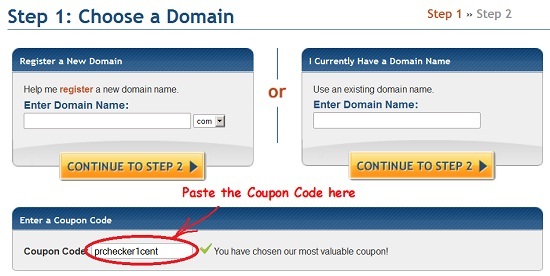 Find Hatchling plan at HostGator.com and click “Order Now” button. 5. Click “Continue to Step 2” button. 6. Choose “1 Month @ 0.01” billing cycle on the next page and lower on the same page get Coupon credit | $9.95 off and Total due $0.01. 7. Type other related details and billing information, choose payment method (pay by Credit Card or pay by PayPal) and click “Create Account” button to continue website hosting account registration. Are there a limit to how many accounts one open with this coupon? I applied the code it works…but first it only took off $8.94 and when I look at billing it appears as though it will try to charge me $8.95 for the consecutive months when the coupon said $.01 per month. So will it adjust every month or will it charge my the higher amount? The coupon applies to the first payment should it be monthly or yearly one, so answering your question – the discount will be applied to the first month (if you pay monthly), and the next month you will be billed the regular monthly fee. this $0.01 is for the first month or forever…??? the coupon provides a discounted price of $0.01 per month for the first month (if paid monthly), and a discount of $9.95 OFF the price if you pay 6+ months in advance. HostGator provided us a new web hosting coupon that works for Hatchling hosting plan gives the very 30% off discount even if you decide to order a long-term hosting plan. Thanks for your coupon. Planning to take another hosting package from them. Hostgator is the Good hosting company. They provide good network with zero downtime. They will resolve most of my issue by chat support itself.